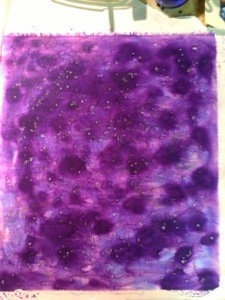 I took a gradations dying class from Cindy Lohbeck. Her class was all about creating color value. I have been learning a lot this past year about value which is basically lightness or darkness of colors. In Cindy’s class we used dilutions just like I did in chemistry class back in college. We made six values from light to dark of seven different colors. It was awesome to make 42 fat quarters of these rich colors. It is something that I am going to keep in mind when I dye in the future. 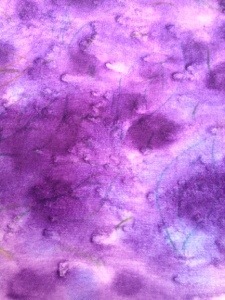 Do you know you can use airbrush paints to pseudo dye fabric. You can heat set them after they dry and they are wonderfully permanent. 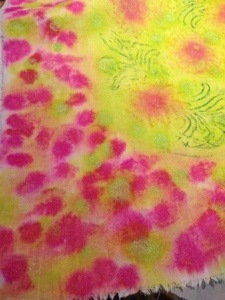 Also, I use Derwent Inktense pencils and blocks to dye and paint fabric. They also become permanent after drying and can be heat set too. Which leads to some really interesting effects if you layer on colors while drying and heat setting in between rounds. And, I’ve been pondering the idea of getting into real dying with chemicals and vats and all that. I haven’t made that leap into yet another big mess yet. Then I saw a new thing when I was wandering around the art store. Lumi. Lumi dyes are photo sensitive. With regular paints and dyes you can get a big of a photosensitive effect due to unequal drying and wicking of moisture through fabric and some paints and dyes are somewhat photosensitive. 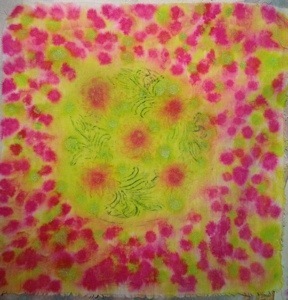 However this Lumi dye is like doing old-fashioned photo printing on fabric instead of photo paper. You spread the stuff on the fabric, put a printed transparency (your photo negative) on top, lay the stuff in the sun for 10-20 minutes (or maybe 30 on a cloudy day) and wa-la! You have a mono print. Today I”m trying a photo transparency, laying objects on the Lumi coated fabric, and printing using the Lumi inks. You can also layer different colors of Lumi dyes. Print and rinse. Dry and printing again. You can get some really interesting effects this way. Author FreeFormQuiltsPosted on September 5, 2014 September 5, 2014 Categories TechniquesTags art, dye, dying, fiber, Lumi, printing, quilt fabric, textile, textilesLeave a comment on Lumi dyes are intriguing! I have been reading online about ways to color and embellish fabric. I saw references to using air brush paints diluted and then used like dye. You heat set them after they are dry.